I'm still out gallivanting around so I have another guest for you today. Jean from Backyard Bungalow. Jean lives in historic Butte, Montana in a Craftsman home built in 1920. 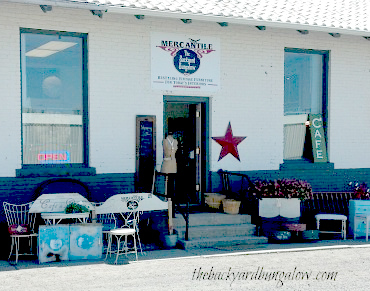 Her blog is all about my adventures (and sometimes misadventures) in updating and decorating her house with antiques and vintage goods she finds at garage sales, thrift stores, estate sales or wherever cool things from the past are waiting to be discovered. She is also the proud new owner of a real life store! And she agreed to fill in for me in her spare time - which I don't imagine she has much of while keeping that shop full of goodies. I find there are two kinds of people in the world when it comes to their everyday stuff. Everything out or everything in. I’m an everything "in" kinda person. Meaning, I like my stuff hidden or out of the way so everything the eye sees is clean and purposeful. Don’t get me wrong, I like my tschotskes and knick knacks, but to me those have a visual purpose. Anything without visual purpose has to be hidden away…eventually. Here’s my solution to my electronic clutter. What I call a charging station. I took an old metal breadbox and spray painted it with Kilz primer first, waited for it to dry and then sprayed it with my favorite Rustoleum color Heirloom white. Unfortunately, I don’t have any pics of the painting. But I’m sure you can all visualize a sweats-wearing, ponytailed woman crouching in her basement asphyxiating her husband and two cats with spray paint. Next I drilled a hole in the back of the bread box with a 1 ½ “ drill bit. I learned something along the way here….put a 2 x 4 behind your project so your drill doesn’t tear through the flimsy metal breadbox. And go SLOW! I didn’t do that the first time and ended up with a jaggedy-edged, un-circular hole in the back of my bread box. This one was for me, so I didn’t mind, but in the future for the ones I intend to sell, I will definitely be doing it the “right” way! I also found a grinding point set made by Craftsman that will grind and debur steel, aluminum and other metals. It's the perfect finishing touch for smoothing out the edges on the hole. Finally, I took an 6-outlet power strip and put it inside the breadbox and threaded the plug through the hole I created in the back. My next step was building a shelf. Some breadboxes will already have a shelf and that will save you this step, but you will probably have to cut a second hole. One hole above and one hole below the shelf for the plug. Kapish? I just took scraps of wood and glued them together INSIDE the box. There was no way to get the shelf inside the box had I created it outside. I think glue will be sufficient to hold it together since it’s not going to see a lot of wear and tear. When I was done, I stenciled the outside with one of my favorite Maison de Stencils French Stencils. I had a hard time getting the stencil to lay flat on this rounded and weird surface, so it didn’t come out perfect, but I’m perfectly happy with imperfection! Thanks for helping a girl out while she's on the road. I hope you guys will take a minute and click on over to the Backyard Bungalow. She's got a lot of candy for the eye. This is a very cool idea, Jean! And Karen...I love the new masthead! It looks great. Great idea Jean - we need one of those, we're constantly losing our phones so if only for the reason that we would know where they are - that they'd be charged would be a bonus!!! If you haven't had the chance to poke around Jeans blog, do it. She has some great stuff and makes cool signs. I love this idea! 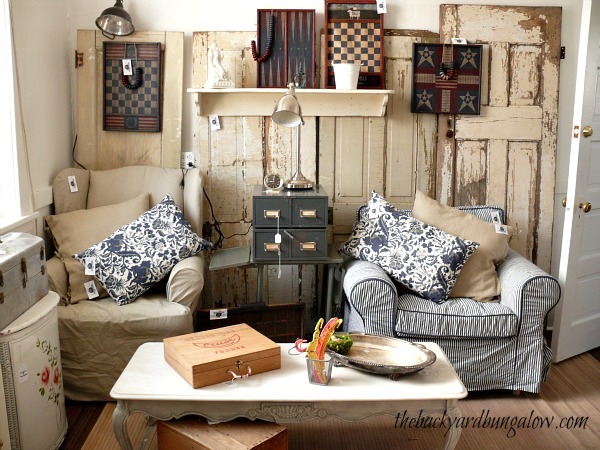 Cords make me crazy and having all of them hidden in such a pretty way is just brilliant! What a great use for this piece and you sure did a great job of cuting it up a little! Nice project Jean! Lovely! Also, love the new look, Karen! and happy belated birthday! Hope you had lots of cake. Great project, Jean! Cute and practical. Can't beat that! I love your new look, Karen, and I take it I missed your birthday and the cake! Sorry on both counts. Hope it was a good one! I love this project, Jean! Wish I could come play in your store- it looks wonderful. Love it! It is such a great idea and it looks great! I just bought that very stencil. Now I simply MUST find that metal bread box to transform. I love this project.